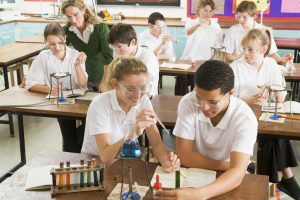 Inspire students to innovate at your Science Fair by awarding innovation and mastery of 21st Century Skills. Reward student’s mastery of 21st Century Skills with these large 17 inch semi-spherical, gold metaltone balloons + 7 inch elastic bands. These large balloons can either be filled with helium or with air and used as “punch” balloons. Each order comes as a variety pack based on skills: Creativity, Communication, Problem Solving and Teamwork. A pack of 50 includes a variety of each skill, plus one additional one. These balloons hold air for 3+ months and “fly” for 30-50 hours when filled with helium. Made from 100% biodegradable, natural latex (from unharmed rubber trees). Made in the USA. The balloons come packaged in bulk of 50. Perfect for keeping crucial documents safe and easily accessible, this red semi-opaque 3-pronged folder reads “My Science & Engineering Fair Notebook.” It features 2 pockets, perfect for Science & Engineering Fair project notes. The polypropylene construction of the folders help to maintain the pristine condition of your three-hole punched papers. Available this October! Students will be inspired to complete their work on time with these playful Mood Pencils. They read “I write my future in science and engineering”. The pencil is heat-sensitive and will turn from black to red when exposed to heat! The pencil features No. 2 graphite lead and a neon red eraser that gives a visual clue to the color changing feature of the pencil. Available this October! Let them soar with this fun and inspirational glow-in-the dark frisbee. Frisbee has a lite green tint and black lettering. 9 inch diameter. 20 frisbee bundle. Made in the USA. Inspire every student at your school to participate in your Science Fair by giving them all a fun, full color bookmark! One side reminds students of the 6 simple steps for completing an innovative Science & Engineering Fair project. While the other side reads “I will question everything. I will do my best. And when I fail, I will learn.” Bookmark size is 2×6 inches with rounded corners. Includes 400 bookmarks. Made in the USA. These cool rulers really measure up! 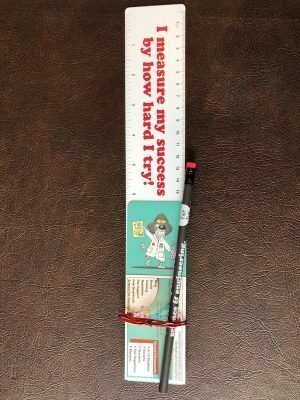 This 12” white flexible plastic ruler reads “I measure my success by how hard I try!” and features both inches and centimeters. The ruler is made of thin 20 ml plastic that is flexible, yet durable. They’re perfect to have on-hand in classrooms, office supply closets and at home. Available this October! Make a statement with these Hanes(R) heavyweight 100% preshrunk cotton t-shirts which proudly read “I’m on a mission to Make Science Fair Fun(R). These tagless, comfortable and appealing shirts are white with black lettering. They’re designed with double-needle armholes and sleeves for both durability and longevity. They come in sizes XS-XL. Available this October!